The aura of domesticity which surrounded Queen Victoria and her Consort spread down the social scale, and card playing was one of the pleasures which could be shared within the large Victorian family circle. 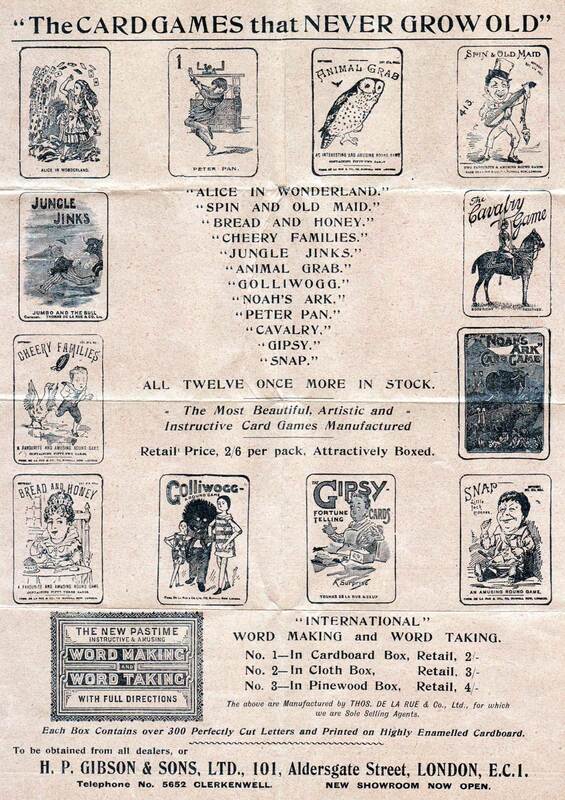 A games advertising leaflet found inside Animal Grab card game, c.1910 describes or mentions a selection of card games (Gipsy Fortune-Telling, Animal Grab, Peter Pan, Golliwogg, Jungle Jinks, Alice in Wonderland, Cheery Families, New Testament, Bread & Honey, Noah's Ark, Poems, Snap, Countries of the World, Impertinent Questions and Military Whist or Flag Whist) along with other party games such as Jutland, indoor shooting games or race games and Mah-Jongg, manufactured by De la Rue for Gibson’s. 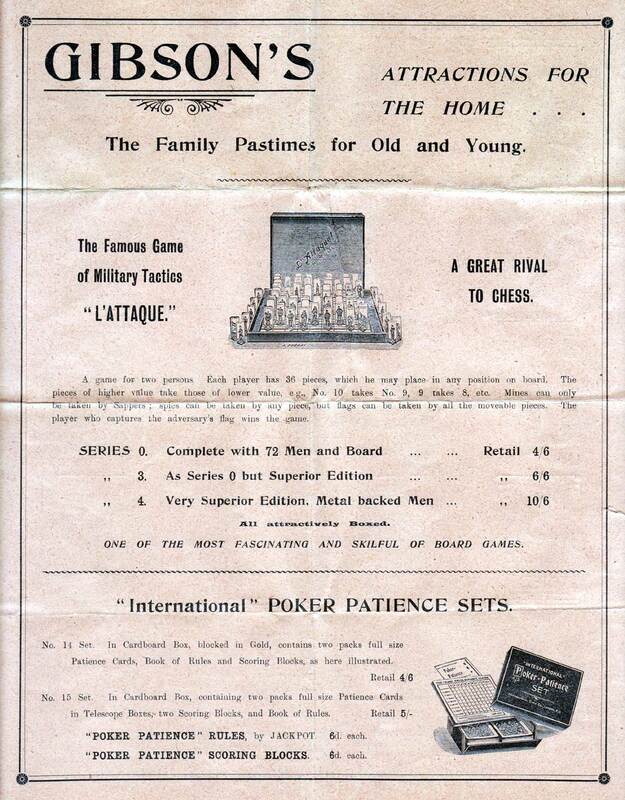 The leaflet goes on to describe the quality of the card games as printed on fine cardboard enamelled on both sides and with ornamental design on the back... with the retail price as two shillings. The retail price in around 1900 had been one shilling. 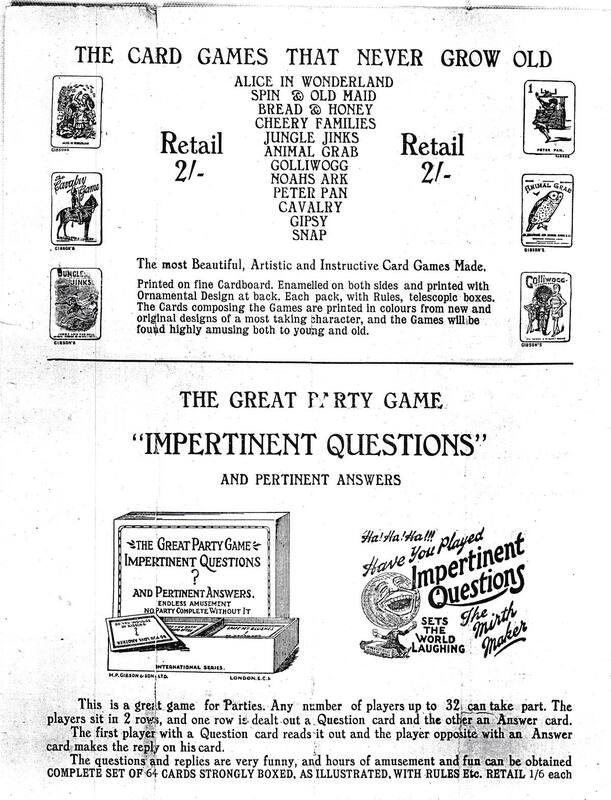 Above: front and back of an advertising leaflet promoting a selection of family and party games produced by Thos De La Rue & Co. for Gibson’s, c.1910. (Note: the original leaflet is printed in red on cream but has been converted to greyscale for ease of viewing). De la Rue’s games were of the highest quality and expensive. Most of them seem to be akin to the standard range of games like Snap, Happy Families, Old Maid or Quartet but with a twist. 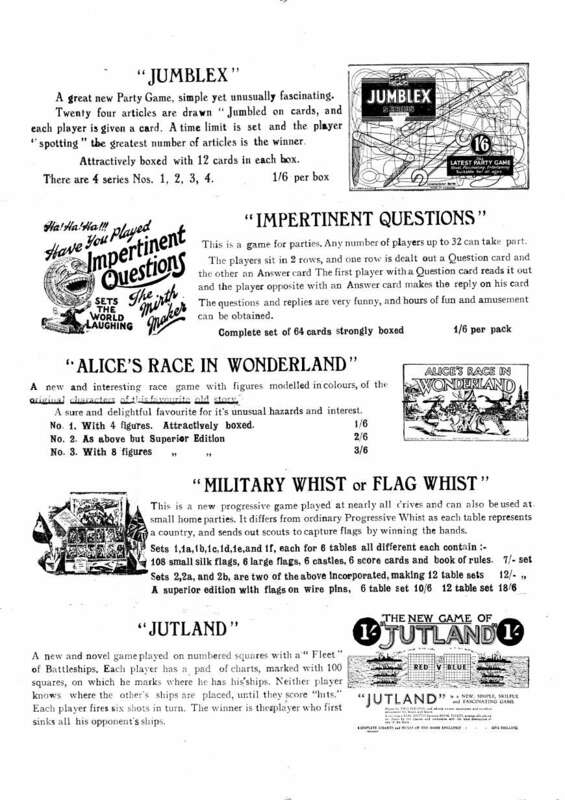 For example Golliwogg, Alice in Wonderland, Cavalry Game and Peter Pan are basically Quartet Games while Animal Grab, Stop Thief and Snap of course are all versions of Snap. Jungle Jinks and Noah's Ark are Triplet Games as opposed to Quartets. Lobo, Kikit, Bread & Honey and Tempest are a bit different from the others. 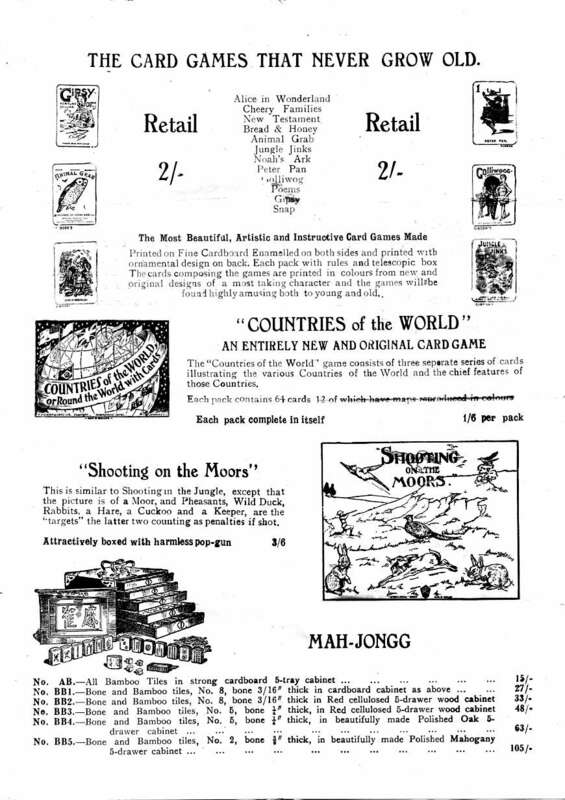 Most of the 1900 onwards DLR games were passed on to Gibson’s "International Card Co." Apart from any of their own games Gibson’s were mainly promoters of DLR games (as well as games from "The U.S. Playing Card Co." etc.). They probably continued them until the 1920s at least, while they were still made by DLR. The DLR original editions were in dark red, green, blue, brown or black boxes with just a coloured special card stuck on the front. The Gibson editions were in white boxes with a special coloured card on one side and the other side printed with the title and a blurb. 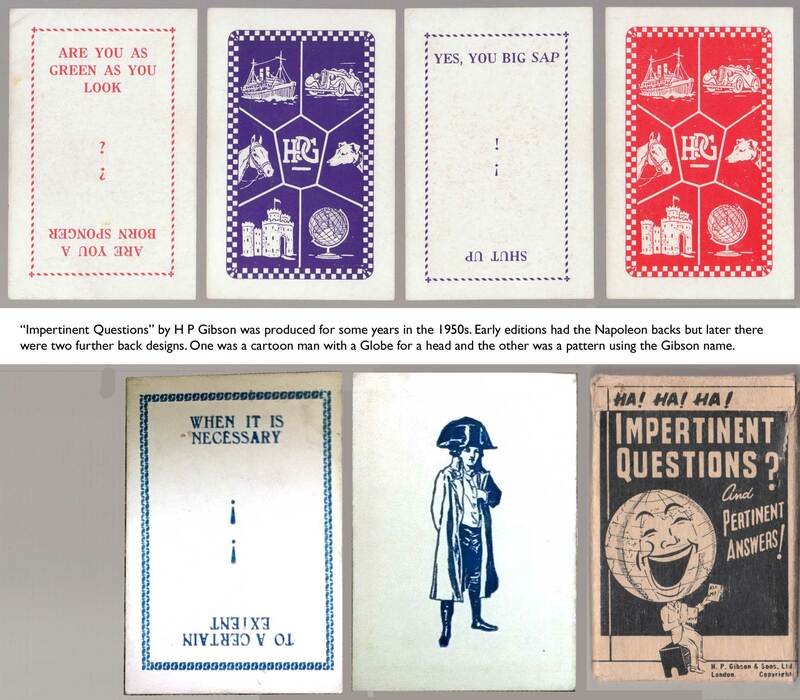 Games later produced by DLR for HP Gibson & Sons included: Cavalry; Countries of the World (3 series); Jumplex and Peter Pan. 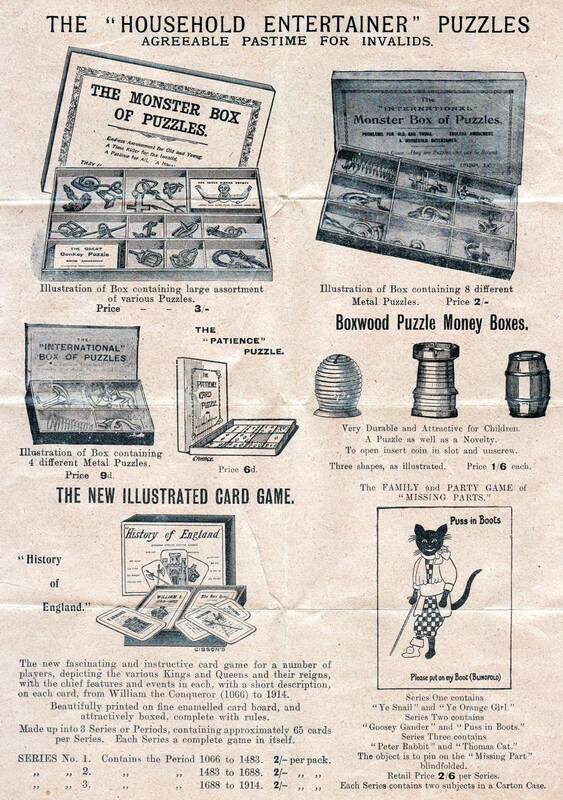 Above: leaflet promoting a selection of family and party games produced by Gibson’s but manufactured by Thos De La Rue & Co., c.1920. Image courtesy Rex Pitts. 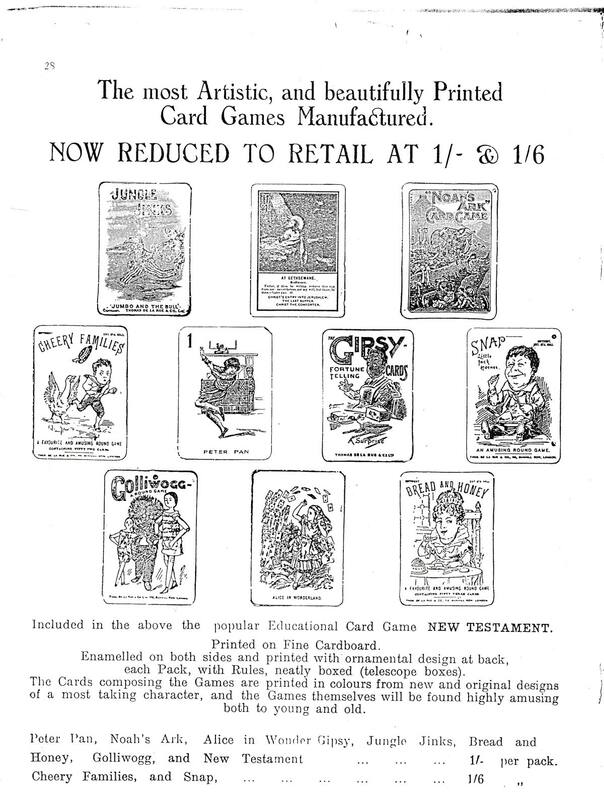 Above: leaflet promoting a selection of card games produced by Gibson’s but manufactured by Thos De La Rue & Co. with the retail prices reduced possibly because of the anticipation of war coming or it may be that they had taken over completely the marketing of DLR’s games and they were now printed with the Gibson name on them. Image courtesy Rex Pitts.